Is anger a positive or a negative emotion? If you read this blog regularly, it won’t surprise you to hear me say that I think it all depends – it depends on what you do with your anger. Anger is often associated with shouting, swearing, and various abusive or violent behaviours. This is what gives anger a bad name, that often, angry people inflict their anger on others who don’t deserve it. Many a friendship has been lost in this way, many a relationship has ben destroyed. Even when your partner has done something to make you angry, it is very unlikely to be constructive to display your anger in an uncontrolled manner. It will, most probably, leave them liking you less, fearing you more, and also will leave you feeling guilty about your behaviour and liking yourself less. It is much better if you can understand the feelings that lie beneath your anger – maybe you are hurt or scared – and explain that to your partner : “When you threatened to leave me I felt very angry with you, and I also felt scared that you might actually walk out.”. Such statements can open the door to constructive conversation rather than destructive arguments. Of course, it’s difficult to sit and have a calm conversation when you’re feeling angry, and so it’s good to be able to diffuse your anger, to take the edge off it, to bring it under control, before you try to talk about it and what has caused it. One good way to do this is with some vigorous exercise – going to the gym or for a run, digging the garden, doing the housework. Anger can also be difficult because it can leave us feeling out of control, and so doing something that gives us a feeling of control can be useful – tidying up, watching a favourite TV show or listening to a familiar piece of music might be helpful. 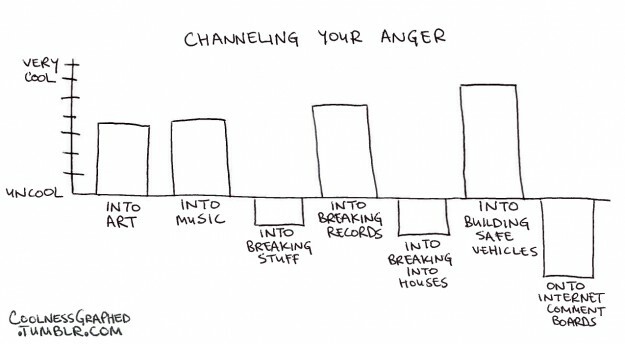 We all have our own ways of dealing with anger and it is good to be aware of what most helps you. Underlying the top level of anger, the level that makes us want to shout and scream, there can be a deeper anger, an underlying feeling, and this is often associated with a sense of injustice – something done to us, maybe a long time ago, may leave us embittered and angry. Equally we may feel angry about how a friend or relative has been treated, or about poverty in the third world, or whale culling, or discrimination. Such underlying anger can be very powerful. There is a huge energy lying beneath the surface. This anger, this energy, can be a huge source of strength if channelled into something constructive. It may be that you have a creative outlet for this anger, if you are musical or artistic for example. Picasso’s anti-war painting, “Guernica”, springs to mind. Sports people often have a way to channel such energy into intensive training or performance – as if they are compressing a gas into a small container. For others of us, it may be that we can better achieve our short-term goals by taking our anger and changing from it a destructive emotion to a constructive one. If we have suffered great injustice or just a lot of bad luck, we can be left angry and feel that we are a victim of malevolence or circumstance. If we can take that anger and use it to fight for something that we want to achieve it can turn our negative emotions to positive ones. Then, rather than feeling like a victim, we can instead see ourself as a survivor; rather than feeling sorry for ourself, we can instead feel pride in what we’ve done. This entry was posted in Feelings and tagged anger, arguments, behaviour, change, control, emotions, feelings, relationship, survivor, victim. Bookmark the permalink.